If you have watched a Formula 1 race anytime recently, you’ll have witnessed the strange phenomenon of the safety car in action, the undignified spectacle of one of the world’s most desirable sports cars – the Mercedes GT – looking decidedly plump and wallowy as it scrambles to stay ahead of a field of low, lithe, dartingly agile F1 cars, desperately trying to go slowly enough to stay behind it while the chorus of driver complaints rises and rises in volume. Comparing the Grand Prix Audio Parabolica to more conventional turntables, is to experience the same slightly bewildered sense of absolute superiority. 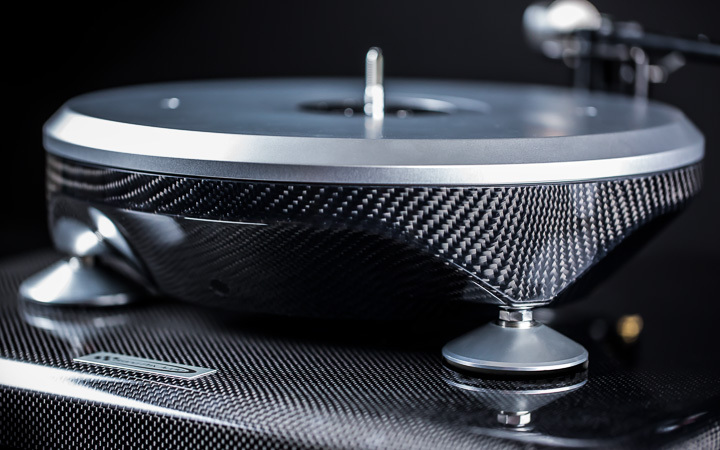 With its sleek, compact chassis and no-nonsense, engineering-led aesthetic, the Grand Prix turntables don’t look or sound like the top-flight competition. At a time when ‘serious’ record players seemed to be the size and weight of a small chest of drawers loaded with concrete blocks, Grand Prix’s original Monaco was little bigger than the records it played and a mere five inches tall. Despite that and in a market where size apparently matters, it took on all comers and vanquished them. Just like the F1 cars its name brings to mind, its diminutive dimensions represented the ultimate distillation of pure performance, a shocking superiority to the run of the mill. The latest Monaco v2.0 still sits at the top of the GPA tree, still taking on the over-weight and over-priced competition while gaining in engineering sophistication, performance, and price as the years have gone by – although it still represents a serious bargain compared to other high-end offerings. But at the same time, that increase in price has created the opportunity to offer a more affordable version of the company’s proprietary direct-drive technology and its elegant chassis. But there’s much, much more to this turntable than direct-drive and a bit of carbon-fibre. Like everything else in audio, it’s not what you use but how you use it that matters, and in the case of Grand Prix Audio, execution really is everything. The clue is in the name, both of the company and the product itself. Chief designer and engineer Alvin Lloyd was one of the founders of the all-conquering Swift Racing, a company that dominated CART racing in the US, as well as supplying chassis and engineering components to Formula One teams. In this case the Grand Prix moniker is more than just an affectation. That matters because it signifies both a pure performance background and a certain skill-set and experience. These days, making stuff from carbon-fibre isn’t difficult, with the one-time wonder material appearing on everything from iPhone cases to USB sticks. It’s a decorative trend that has undermined the engineering credibility of a material that has almost infinitely configurable properties – if you know what you are doing. Wrapping something in carbon cloth is one thing: Creating a complete component that is fully optimized to deliver specific mechanical and resonant performance attributes – that’s quite another. Enter then the Parabolica, GPA’s more affordable turntable, a product named for the fiendishly difficult curve that graces the Monza circuit, a name that reflects the significant challenge of down-pricing the Monaco without damagingly diluting its performance. Outwardly the Parabolica is almost indistinguishable from its illustrious older brother: the same shallow platter, bowl shaped chassis and machined billet arm-board extension, the same minimal footprint, carbon finish, and three conical feet. Yet the Parabolica costs less than half the price of the Monaco while giving away astonishingly little in terms of measured or musical performance. Simply using carbon-fibre may not be that clever, but using it (as well as other materials) to achieve this? That’s very clever indeed! Once you start to look more closely, you can see where the carefully chosen engineering compromises have been made. The Parabolica has a slightly fuller figure than the Monaco, allowing the computer control for GPA’s sophisticated feed-forward speed control system to be housed internally – saving the cost of the external box and cabling. The platter is machined from high-grade aluminium rather than magnesium with a phosphor-bronze flywheel and the feet are simple aluminium cones, although they retain the fine-thread levelling facility of the Apex composite footers supplied with the Monaco (an optional upgrade on the Parabolica). But the real clue lies in the relative weight of the two turntables. The Monaco might be small but at over 18 kilos it is astonishingly dense and inert. In contrast, the Parabolica weighs in at just under 13 kilos, still surprisingly solid, but reflecting the use of a braced carbon-fibre monocoque rather than the constrained layer, polymer damped chassis of the Monaco. Did someone say measurements? Using the 74,000 line encoder disc developed for the Monaco v2.0, together with system specific software matched to the same motor used in the original Monaco, GPA claim speed stability of 0.00011% RMS and peak deviation of less than 0.00015% for the Parabolica. That might not match the Monaco, which reputedly delivers a frankly astonishing further 0.000057% speed error and 0.00008% peak deviation, but it puts pretty much everything else in the shade. For example, the new Technics SL-1000R, which has been widely applauded for its remarkable speed stability, is quoted as delivering 0.015% RMS. I’m not going to get into competing claims and measurement protocols here, but you get the picture. There’s direct drive and then there’s direct drive: there’s speed stability and then there’s speed stability. But the best thing about the Parabolica’s measured performance is that it’s performance you can hear. Put simply, this turntable’s musical capabilities are as engaging as they are smack-you-in-the-face obvious.